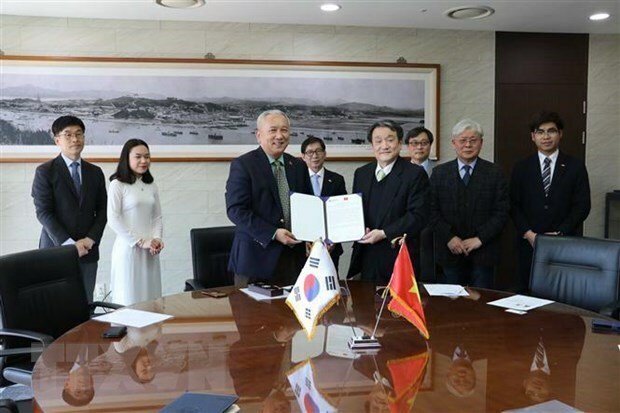 Seoul (VNA) – The Incheon National University (INU) of the Republic of Korea (RoK) and the Vietnamese Embassy signed a deal on scholarships for Vietnamese students on April 3. The deal, inked by INU Rector Cho Dong-sung and Vietnamese Ambassador Nguyen Vu Tu, will be valid for five years from the day it was signed. It is expected to facilitate cooperation between the university and the embassy in helping talented Vietnamese students study in the RoK. Under the document, the INU will grant full or partial scholarships for four years to competent students introduced by the Vietnamese embassy. After the signing ceremony, Ambassador Tu visited Vietnamese students learning at the INU’s Korean Language Institute. At present, there are 1,390 Vietnamese students learning at the institute, and the figure is expected to increase to 2,500 by the end of this year.